Being food bloggers we all are big time foodies and love to cook food. We all plan our menus well especially when we are expecting guests and to my understanding the best way to impress the guest is with the starters or entrée. If the starters are impressive half the battle is won. So inviting all my fellow bloggers and readers to participate in April’s Event with the theme Snacks and Starters. The event is guest hosted by Raji of Vegetarian Tastebuds. The details and rules of the event can be checked there. 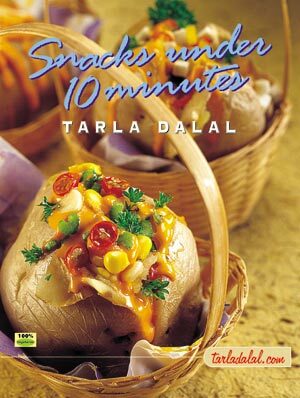 The giveaway is sponsored by www.tarladalal.com ,is a Cookbook, Snacks Under 10 Minutes. It’s a book that we all can make good use of in today’s speedy world to eat healthy and interesting snacks. Very nice useful theme.Happy Hosting! Interesting theme! I am totally clueless when it comes to snacks so looking forward to some wonderful entries. kindly let me know if i can add my snacks but not starters over here. You can add either of them dear.